Thank you, thank you, thank you for all of the lovely comments, messages and good wishes sent yesterday, my moving day. I was very touched and I appreciate every single one. The move itself went well, very smoothly, and although I felt a little sad when I finally turned the key, the overwhelming emotion was one of relief that this particular chapter is over. Because we’re in rented accommodation until my new home is ready, I had to take our cats to a cattery. I put them in the carrier, taped it closed, popped it in the boot and set off . Cats and car journeys do not mix, and the incessant meowing and wailing got louder, leading me to suspect that the cats might be out of the bag as it were. What I didn’t expect, however, was for one of them to bolt up through the parcel shelf and launch herself at me whilst driving at 69 60 on a dual carriageway. She was crazy, flinging herself round the car and howling. In the end, she got up onto the dashboard, scratching at the window. I can hear everyone now…Yellow car. Cat on dashboard. Spinster. That was, I think, the most stressful thing about yesterday. 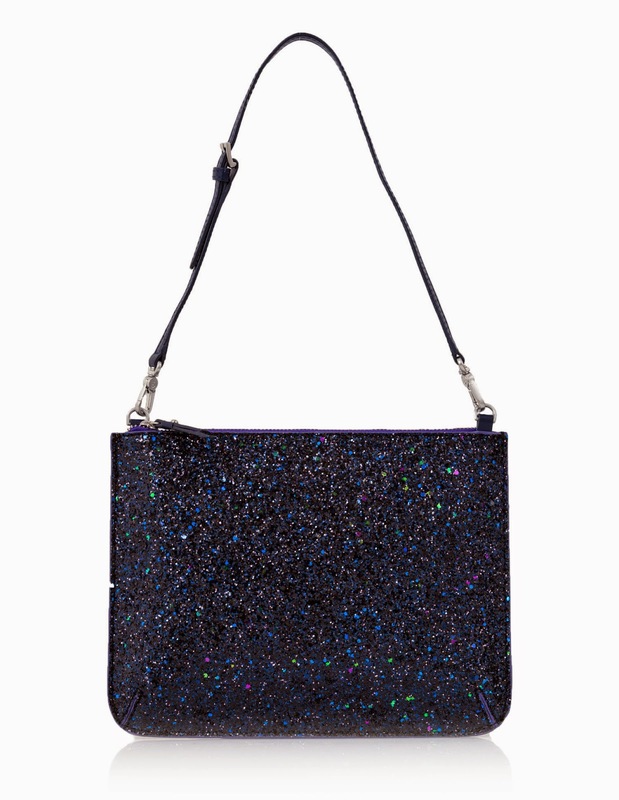 I ordered a whole load of sparkly things a few weeks ago from Boden, (having sold a no longer loved Mulberry bag to fund this), some of which I have worn already and some of which is reserved for upcoming events, parties and Christmas Day. So all of these come tried and tested. Until Thursday, there is 25% off EVERYTHING at Boden using the code X4K7, so it’s a really good opportunity to buy those investment pieces and little extras. I have more dresses than anything else, but It’s still the first section I go to on the website and I find it much easier to accessorise a dress than I do separates. That being said, I do love to wear a sparkly top with skinny jeans and heels. The Luxurious Lace Top is one such top that could be worn with skinny jeans. Equally, though, I think it could be dressed down with boyfriend jeans or dressed up with a skirt. It comes in four colours. I have it in the navy and pewter and I wore it a few weekends ago for an evening out with my cousin. 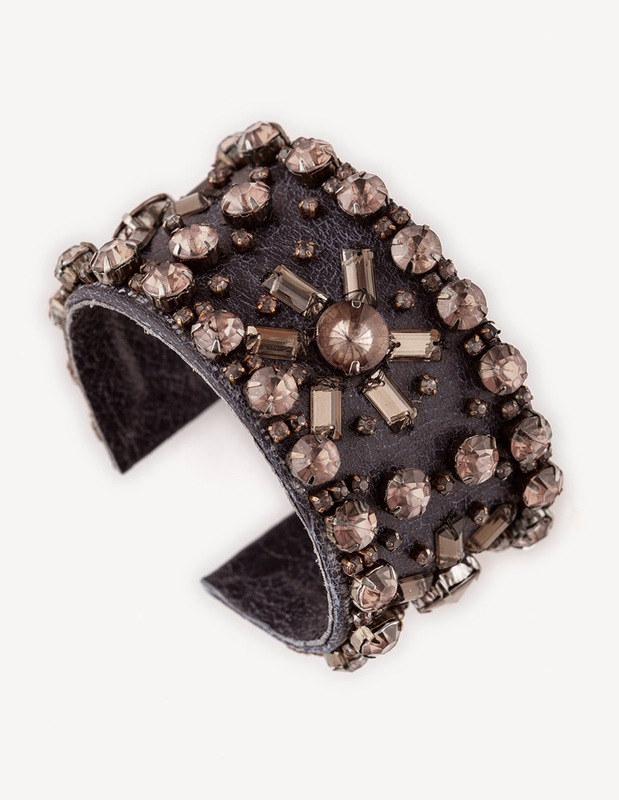 The Bejewelled Cuff is also from Boden and is a greyish navy (if that makes sense), so would work with black, navy and grey tones. Relatively speaking, this is quite an edgy design and I love it. The top comes in a dress version too: The Luxurious Lace Dress. It also comes in a choice of four colours. It’s fitted and is a unusual in that it almost looks like two pieces. I’m going to whisper this, but I have this dress as well as the top. At this time, it’s the front runner to be my Christmas Day dress. It is very flattering and has a lovely v back. The damson colour is beautiful but I also think the classic black would be a timeless addition to the party wardrobe. And the Sequin Shimmer Tunic Dress (scalloped edge, sequins, lace- how could I resist?) which I can confirm is absolutely stunning (and low stock in most sizes). 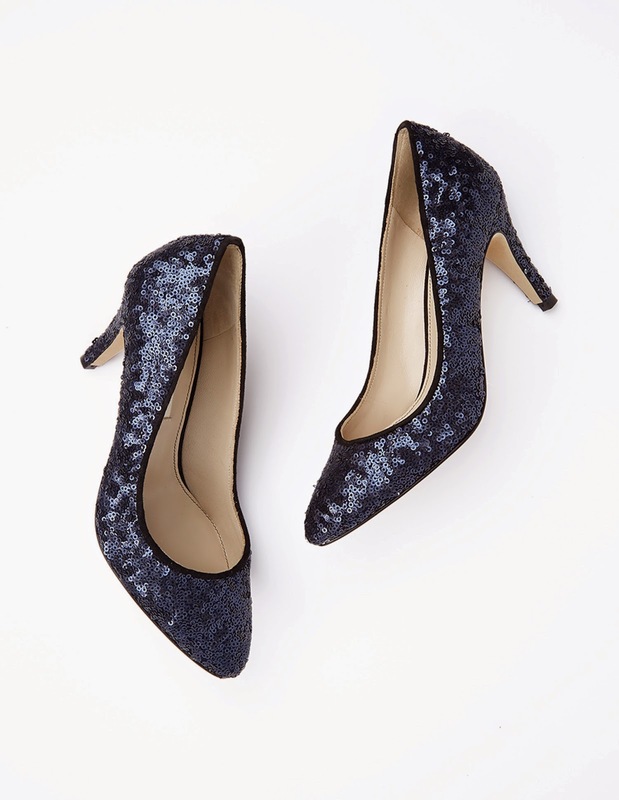 I don’t need any more shoes, said no woman ever, so it was with squeals of delight that I opened up these beauties: The Spectacular Heel in navy sequins. I wore these on the same night out with my cousin. They’re a perfect mid-heel and very comfortable (although I did insist on a taxi home so not to spoil them). They are low stock in most sizes and have sold out in my size (41), so I’m glad I invested when I did. 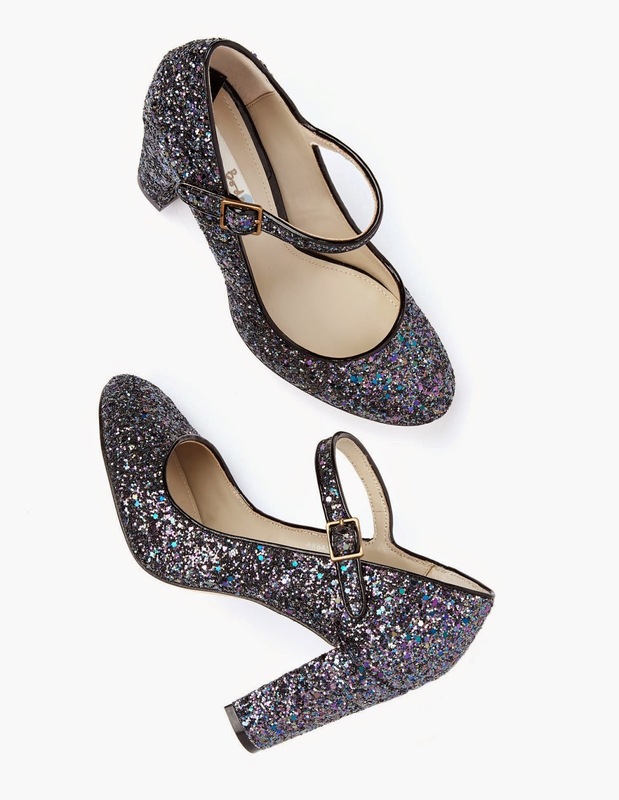 I also ordered these multi glitter Mary Janes. I coveted some very similar from Jimmy Choo for about three years, knowing they would match so many things. I didn’t indulge but have looked out for multi glitter ever since, so I was thrilled to see these. And they match the Zip Top Clutch that I have used a few times already. I love how all the glitter, sequins and embellishments come out in the festive Winter months! I've actually got a "festive sparkle" blog post in the making, so I'm looking forward to browsing all those lovely pieces to include. The cat incident sounds pretty terrifying! Cats can be so crazy sometimes.